Quilted down jacket by SCHNEIDERS SALZBURG made of water repellent microfibre with an iridescent shimmer. 100% nylon. Wonderfully warm and feather-­light thanks to the top quality filling made of 70% down, 30% feathers. Elaborately designed with functional details including a detachable hood with drawstring and stoppers, a high closable, padded stand-up collar, concealed press stud front and 2-way zip fastener and 2 welt pockets with press stud fastening. Lining in 100% nylon. Contrasting back with sandwich quilting and additional mesh lining at the shoulders. Length approx. 31ins. 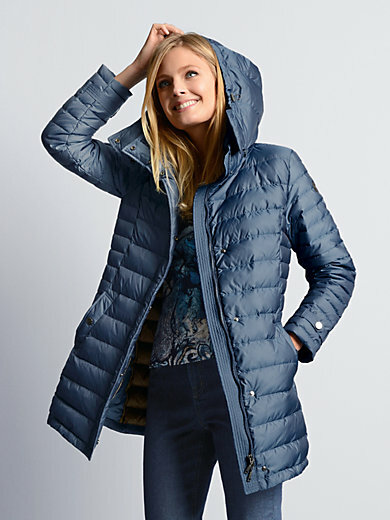 The quilted down jacket is machine washable.